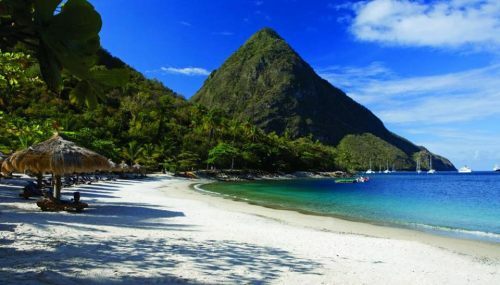 Air Canada Rouge is selling off some *very* last minute seats from Toronto to the Caribbean island of Saint Lucia for $351 CAD roundtrip including taxes. The flights leave tomorrow (Dec 9th), and are non-stop. ^^ very important, a lot of people miss this, and think they can't find the deal. February flights: All 1 week trips departing on Feb 1, 2, 3, 5, 6, 7, 8, 9, 10, 12, 13, 14, 15, 16, 20, 21, 22, 23, 27, or 28 ($370 CAD roundtrip including taxes) -- new! The price may show up as $301, but it'll change to $351 on the next page. 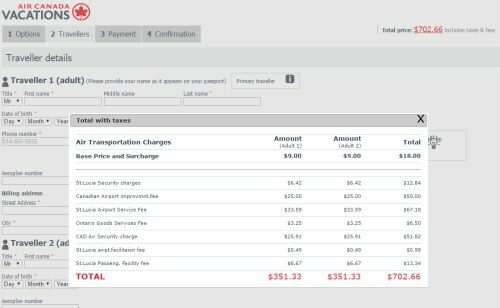 When you see $702, that's for 2 passengers. Where to stay on St. Lucia? The map below will show you some great deals on accommodations in St. Lucia for under $99 CAD/night for 2 people. I've found that Saint Lucia is one of the few Caribbean islands with a high number of reasonably priced Airbnb accommodations. The average price per night is still quite high ($275 CAD), but there are so many Airbnb rentals, that it's pretty easy to find well-reviewed places being offered for $50 to $85 CAD per night for 2 people. If you were to actually book this flight, you would probably want to use the 'Instant Book' filter on Airbnb, which only shows you properties that can be booked instantly, without waiting to hear back from the host. Update 12/20 - A few last minute 'over Christmas' flights (Dec 21-28, Dec 22-29, Dec 23-30) have dropped to $351 CAD roundtrip including taxes. On Airbnb there are currently 36 'instant book' properties under $99 CAD/night for 2 people on these dates, although the best deal looks to be Colvin's B&B for $105 CAD/night (5 stars after 19 reviews). 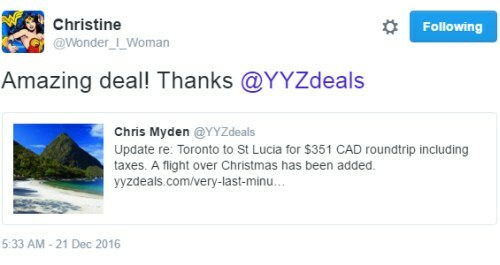 Update 12/29 - The 'over New Year's Eve' flight (Dec 30 to Jan 6) from Toronto to St. Lucia has now dropped to $352 CAD roundtrip including taxes. On Airbnb there are currently 39 'instant book' properties under $99 CAD/night for 2 people on these dates, although the best deal still looks to be Colvin's B&B for $105 CAD/night (the other room on his property has 5 stars after 19 reviews, this one has 5 stars after 3 reviews). Update 1/3 - Air Canada Rouge has now dropped the price of their flights in the first half of January from Toronto to St Lucia down to $372 CAD roundtrip including taxes. The dates have been added to the list of dates at the top of this blog post. On Airbnb there are currently 63 'instant book' properties under $99 CAD/night for 2 people on these dates. 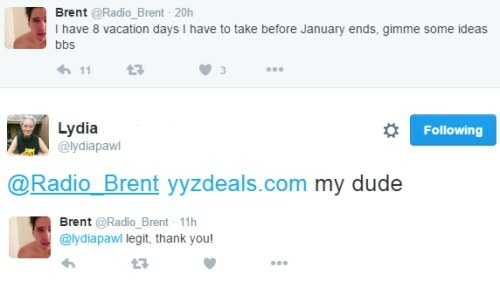 The best deal looks like either 'Gravill's Vacation Rental' ($82 CAD/night, 5 stars after 12 reviews) or Colvin's B&B ($106 CAD/night, 5 stars after 20 reviews). toronto, yyz, caribbean, eastern caribbean, flight deals, southern caribbean, saint lucia, uvf, air canada rouge, windward islands, lesser antilles, st lucia and hewanorra.